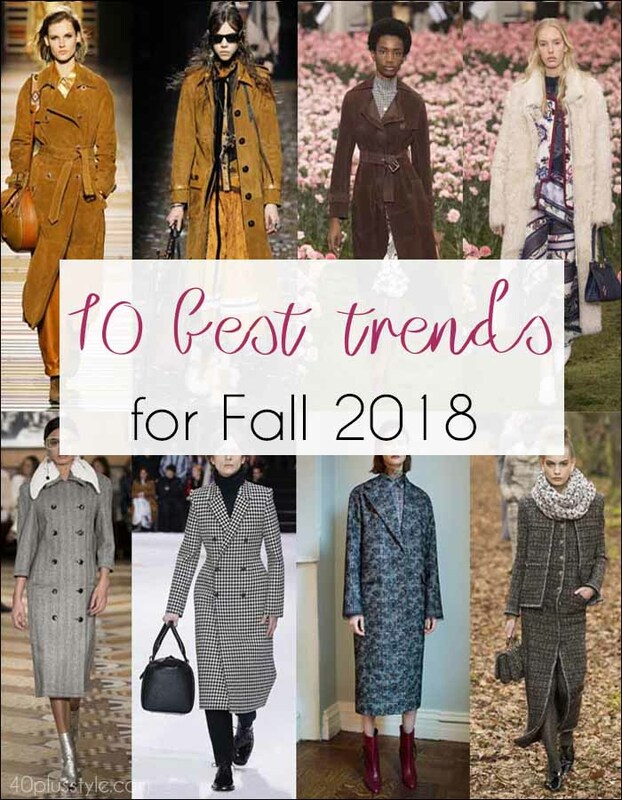 With fall quickly approaching, it’s time to turn your attention to the best trends for Fall 2018. As ever, the runways saw their fair share of the unwearable. But there were also plenty of covetable, flattering styles on show, including plaid, silk, pleats and animal print. Grown-up, sophisticated and timeless, designers have taken their inspiration from Savile Row tailoring and heritage fabrics to create beautiful coats in tweed, herringbone and plaid. The great thing about this look is it’s a classic which will always be stylish, so if you do invest in a checked coat, you should get plenty of wear out of it year after year. 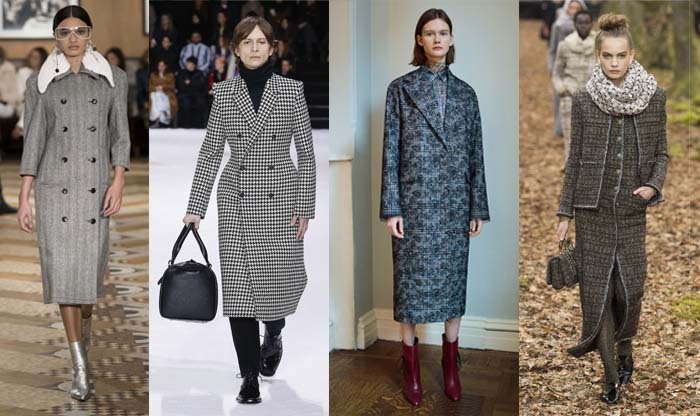 If plaid isn’t perfect for you, then another stylish coat option making its way down the runways for Fall 2018 was the 70s-style coat, either in suede or shearling. 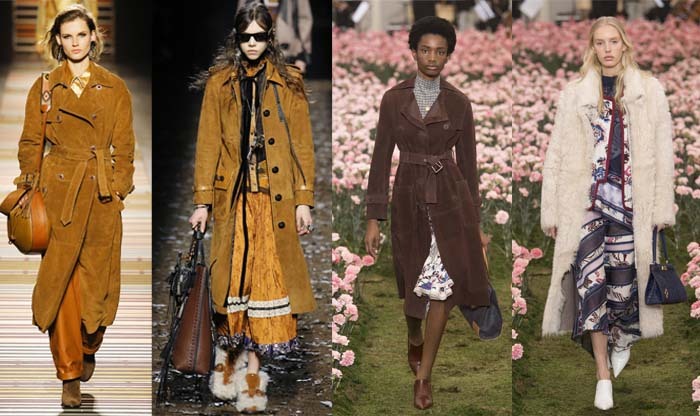 Beige 70s-style suede was given a luxe twist that managed to be both classic and of-the-moment through the use of trench coat styling. Maybe you already have a vintage piece in your wardrobe. Meanwhile, while some shearling options could be tricky to wear because of their bulk, others were more streamlined and sophisticated. From plaid to pleats, many of the major trends for Fall 2018 are ladylike and sophisticated. While the midi skirt was THE length of the summer, it has been updated for Fall with pin-sharp pleats. You could either wear pleats with heels for festive parties, or team with long boots and a sweater for everyday wear when the weather turns colder. But, the great thing about growing older is growing in confidence and knowing that you don’t have to be a slave to trends. So, if a midi-length doesn’t suit you (perhaps because that would emphasize your calves), then you could go for knee-length instead. You know those silk scarves which always looked so sophisticated tied around the tresses of the likes of Grace Kelly, Sophia Lauren and Elizabeth Taylor in the golden days of Hollywood glamour? 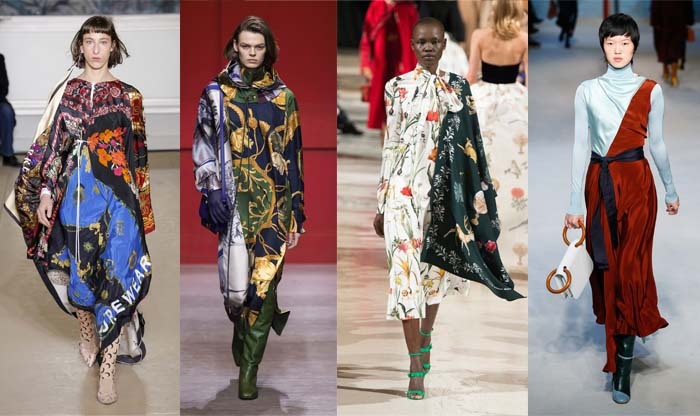 Well, designers have taken that look to create dresses from the same fabric, often with a handkerchief hem to give the impression that they really have been made from vintage scarves. If you find that opting for a full-length dress looks shapeless, you could add a belt, or rather than dresses you could look for blouses in scarf-like fabrics and wear with dark jeans and a blazer. Okay, I know that animal print is a Fall perennial. But, the good news is that means you probably have some animal print lurking in the back of your wardrobe already! 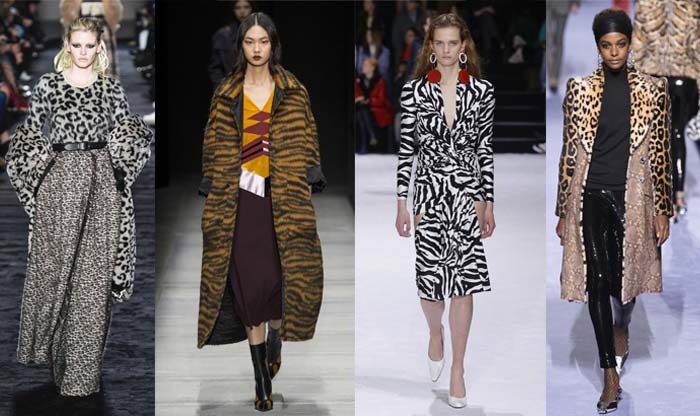 This time around, many designers have eschewed traditional leopard print to go for bolder patterns such as tiger and zebra instead. Or, if they have used leopard print, they have chosen a bright background color such as pink or red, or given their look impact by going for top-to-toe prints. You’ll probably find you don’t want to wear full-on leopard print, but you could choose one element, such as a sweater, pair of shoes or a clutch bag. 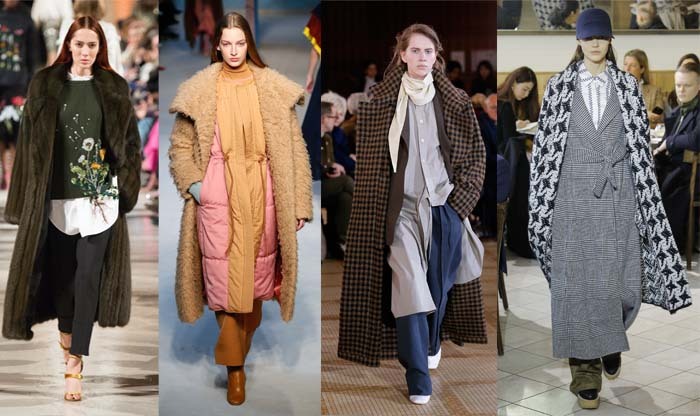 Some designers opted for so many bulky layers, it was pretty hard to tell there was a model in their somewhere, and there were looks such as those featuring puffa coats along with faux fur from Roksanda (above) that simply wouldn’t be worn in real life! But, other designers like Oscar de la Renta went for a more sophisticated approach to layering, letting the tails of a shirt fall below a sweater and topping with a longline coat. Or you could opt to wear a dress over pants, covered by a long coat to get a similar look, without all of that extra weight and bulk! A more wearable option would be to take inspiration from Valentino and wear a camisole under a jumpsuit or top, or from Valentino and team a cape-style coat over similarly hued pants. 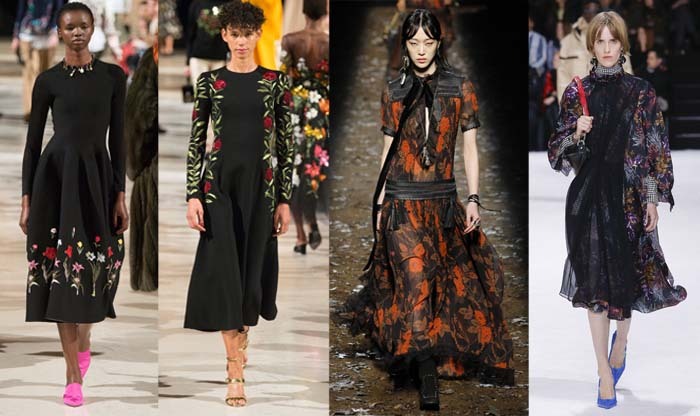 Just because real-life blooms may be, well, ceasing to bloom as the weather turns colder, that doesn’t mean you can’t adorn your outfits with beautiful florals. Designers made sure their creations were winter-ready by teaming flowers with darker backgrounds. There were some striking dresses with sleeves on the catwalks and the hem lengths were also great options for women over 40, falling just before the knee. 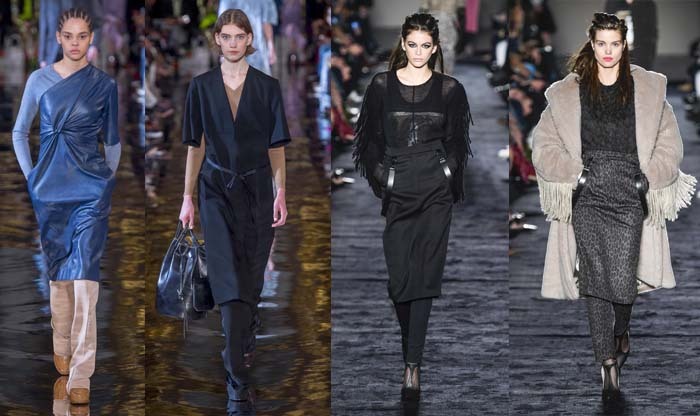 For anyone who wants to elongate their body, creating lovely sleek lines, this could be the season for you! 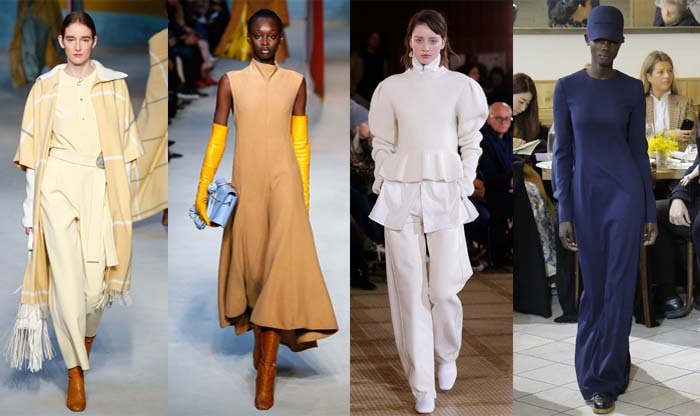 Designers created lovely lean looks through the use of layers in similar hues, while Roksanda opted for dresses which were worn with boots in similar shades, making models look even longer and leaner (as if they needed any help in that department!). Lemaire chose to layer in pale hues from top-to-toe. Gabriela Hearst achieves a similar long look by opting for maxi dresses with long sleeves and matching hats! While I’m not suggesting you wear a dress topped with a baseball cap, wearing similar colors across your whole outfit is a great way to look longer, and leaner. It’s a particularly good tip for dressing if you are petite. 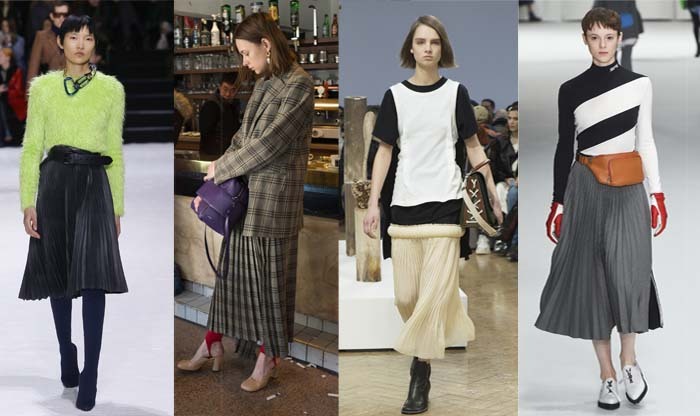 The skirts-over-pants look which was a favorite of the 90s is definitely having a renaissance. Everyone from Celine to Marni to Emilio Pucci has showcased the trend over the past couple of years, and this season, Stella McCartney and Max Mara proved that the combo is still bang-on-trend, so long as you keep your look sleek with slimline pants and skirts. While Max Mara chose skirts over pants, this can be a tricky look to pull off because it’s much harder to get the proportions right. If you do want to give it a try, then keeping your top and skirt similar colors can help. But, it’s a lot easier to style a dress over pants and this is a style I often wear. It’s also a good way to showcase the layering trend without wearing lots of coats! 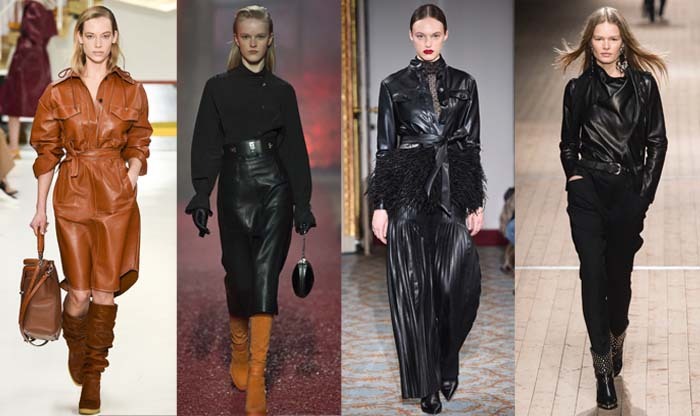 Leather was definitely THE material of the Fall 2018 catwalks, partly because many designers were having something of an 80s resurgence. But, one of the toughest, and classiest, ways to wear leather was the leather dress. You could opt to layer with a blouse or sweater underneath if you choose a sleeveless style. Another stylish way for women over 40 to wear leather is to team a silk blouse or a classic white shirt with a leather pencil skirt. 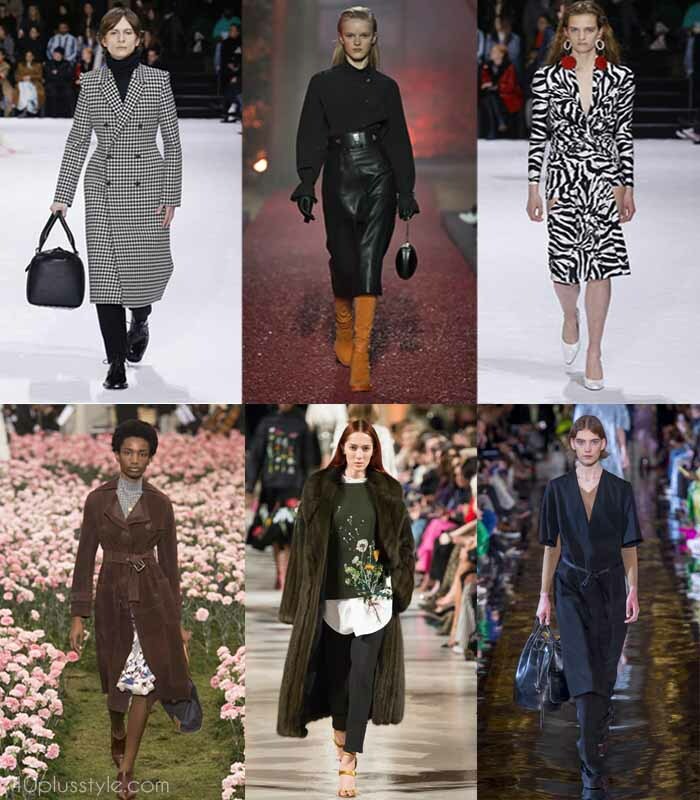 Which is your favorite style from the Fall 2018 trends? Which will you be adding to your closet and how will you wear it? Herringbone, animal print, dark florals p, leather and suede I already own, love and will be wearing this fall. Just invested in a lovely leopard crossbody. I love that green and brown are back. I actually like all the colours you have shown. I would love that sleek cream sweater with shirt and trousers, but as I am already broad shouldered I think that is not a good idea. Great to see the Pied a Poule print of houndstooth. I love that! Fab tips, as ever- and really nice when you know you’ve got a lot of those things in the wardrobe already. I love plaid, suede look, animal print and dark flowers- and I’m a sucker for wearing a dress over pants. The new one I might try is a pleated skirt though they tend to make me look a bit bulky. Almost- but not quite- makes you look forward to the end of summer! Thank you, Sylvia! Next post: The best color trends for Fall 2018: 8 colors and 8 neutrals for you to try!